I'm working with McCalls 7542. Since we all know that patterns don't fit us right out of the envelope, I needed to make several changes to the pattern to make elements of it work for me. For me the sleeve is where I needed to make the most changes, especially since its the sleeve that's the focus of this pattern and my garment. Normally I share all pattern information in the post containing the finished garment and write a separate post about the technique later. This time though if I couldn't get the sleeves to work, there would be no outfit. So I did something I don't normally do or rarely do. I made a sample. See I always alter my sleeves for my bodacious biceps. Unless I'm using a Cashmerette Pattern, I need to make this pattern alteration EVERY.SINGLE.TIME. I've developed various techniques to deal with this depending on the type of sleeve I'm using. Since this is a short sleeve with the ruffle added to the bottom of it, I made a pattern sandwich using my TNT short sleeve, the McCalls sleeve pattern and tracing paper to make a new sleeve. After I had a sleeve that worked for my biceps, my next concern was making sure the hole in the pattern would fit the hemline of my new sleeve. I measured the cutting line and it was too small. Then I measured the stitching line and it was too small. So I added 1/4" all the way around the stitching line seam and used that for my new cutting line. I made a sample from a cotton shirting that I had on hand using the sleeve from View B.
Yeah that's how I look when I'm working in the sewing cave! And yes, I took the time to serge finish the upper and lower sleeve parts. Hey I might want to put it into a shirt or a tunic some day! Anyway that's how I made my sleeve sample work using McCalls 7542 for the next garment up on the blog! Just have to say that I'm crazy about the sleeve alteration and look forward to seeing your finished top. My hope is that you will make youtube tutorials on alterations and how to sew with knits. Very cute! Look forward to seeing the finish! Good sample work. I don't blame you--I'd save those sleeves too. I've debated buying this pattern, but was never quite convinced I'd like the sleeves. Now that I've seen your sleeve, I'm definitely buying the pattern. I just love the way the ruffle falls on your arm, and I can't wait to see what fabric you use and the finished top! Yay! I'm loving every iteration of this pattern and can't wait to see the final version! I can't wait to see your top! Sometimes you just have to bite the bullet and make a sample! I am not sure that some women realize that patterns don't fit perfectly straight out of the envelope or there wouldn't be so many complaints on how badly this or that pattern fits. Or there wouldn't be a million tee shirt patterns out there! 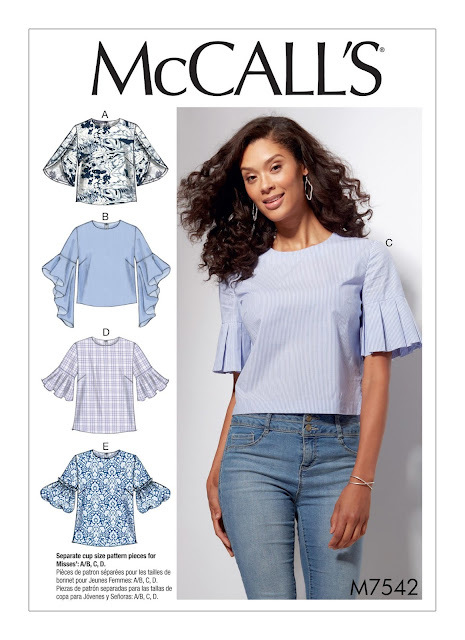 I will admit to trying some new tee shirt patterns recently and, even thought I needed to make some alterations to me me 'perfectly' including the Cashmerette Concord and Pamela's Patterns Tee shirt. I liked both, but the latter is certainly better for an older body! Anyway I look forward to seeing your finished top. I'm learning so much. This is so cool. Wow, that sleeve looks totally different than I thought it would from the pattern illustration. I like it! I was afraid it would look costumey and like it would drag in your plate. But in real life it just adds a graceful fall to the *back* of the sleeve! Thank you for explaining how to do the ruffle alteration to accommodate a larger diameter sleeve. Yay for things that work unexpectedly! It's those unexpected "it worked" moments that keep me willing to try new things! Can't wait to see the finished outfit! Love, love, love it! I also saw that top pattern as a dress, but am making my first version as a top - with those sleeves! Do you have a Sewing List?